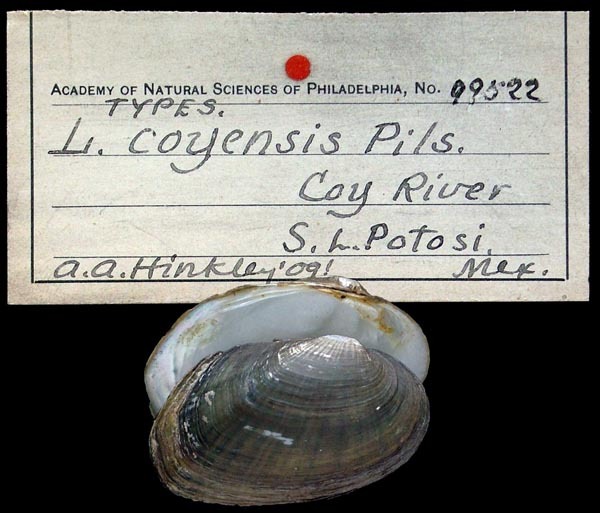 = Actinonaias coyensis Pilsbry, 1910. — Bogan (2010). = Actinonaias coyensis (Pilsbry, 1910). — Graf & Cummings (2007). = Actinonaias coyensis (Pilsbry, 1909). — Haas (1969). = Lampsilis (Friersonia) coyensis (Pilsbry). — Haas (1929). = Lampsilis (Actinonaias) coyensis Pilsbry, 1909. — Frierson (1927). = cf. Lampsilis coyensis Pilsbry, 1909. — Simpson (1914). = Lampsilis coyensis n. sp. — Pilsbry (1910). Pilsbry, 1910, Proc. Acad. Nat. Sci. : 538, pl. 27, figs. 3-4.